It’s in print, but is it true? 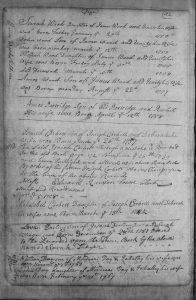 I was recently asked a question that reinforces the point that we must look at original genealogical records, even when the published resources are ones that have been considered trustworthy. The question was about Isaiah Corbett, son of Joseph and Deborah, who was born in Mendon, Massachusetts. There are what appear to be two entries for this particular individual. 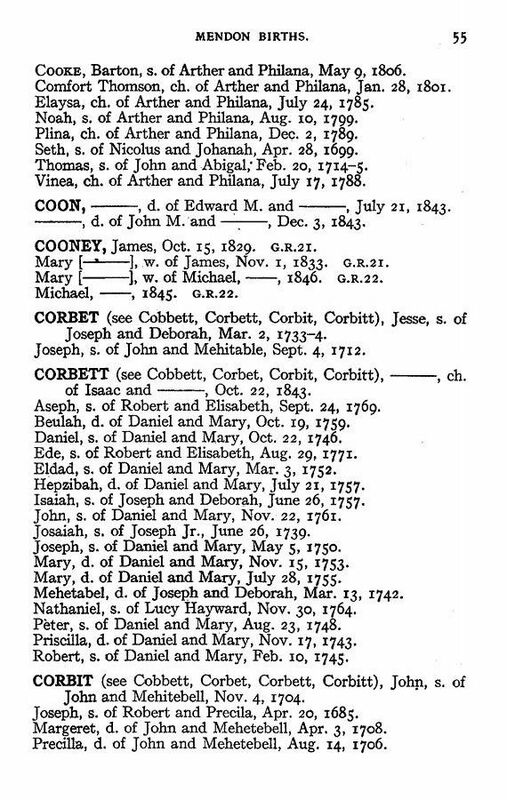 As can be seen in the page from the NEHGS Database “Massachusetts Vital Records to 1850” showing Mendon Births, there is an Isaiah Corbett, son of Joseph and Deborah, born in Mendon on 26 June 1757. Two lines below this is a Josaiah, son of Joseph Jr., born in Mendon 26 June 1739. The fact that the father’s name is the same – with the exception of the Jr. – and the month and date are the same begs the question: Could it be that the abstractor of the records misread Isaiah as Josaiah? After all, that isn’t the normal spelling for Josiah. The person who was researching this question was going with the 1739 birth being the accurate date because he had found a 1757 marriage – again with a double entry – for a man of the same name. The original records for the town of Mendon were microfilmed by the Family History Library back in 1971 and have recently been put online as part of FamilySearch’s Massachusetts, Town Clerk, Vital and Town Records collection, much of which is only available as images online without an ability to type in a name. While the link offers a search for a deceased ancestor’s name, the database also offers the ability to browse through the images with a link at the bottom of the page. When searching digitized images, it is important to remember that when you type in the name of a person in sites such as FamilySearch.org or Ancestry.com, you are not searching the original handwritten documents. You are searching an index typed into a computer by individuals reading those handwritten documents. As a result, to truly exhaust any record – whether it be census, vital, church, or probate – it is important to go through the original images whenever possible. As such, I set about going page by page through the Mendon vital records by clicking on the link for browsing the images. This gave me a list of counties for Massachusetts, from which I selected Worcester. I then chose the town of Mendon from the list of towns displayed for Worcester County. Obviously, not all of these sections applied. But I began systematically going through those links that did cover the time pertinent to the research question. Because I have had experience looking at the microfilms, I began by looking at each link in the multiple images view to get a sense of what was actually on the film. As such, it did not require me to look at each individual image, but to focus on locating the birth entries. And while it may look like it would take hours and hours, it only took about 80 minutes to find what turned out to be a crucial document. An entry on page 42 of item 2 of the Births, marriages, deaths 1643-1835 answered the question of the entries with no doubt, and showed how the published vital records do not always tell the whole story. For many researchers it is easier to search online or to use published volumes, but this question and its answer shows why it can be so important to first cite the source you used and, then, when a discrepancy appears, turn your attention to the original records. So True! Even the published resources sometimes conflict. For example, what one might find in Torrey’s marriages about a particular couple, doesn’t jibe with information found in The Genealogical Dictionary of Maine & New Hampshire, which is different than what can be found in NH Probate records. Even with all of this, because so many early original documents do not exist anymore, one is left with un-answered questions. We are at least documenting what we have found, so that hopefully finding new or over-looked sources we have a record to work from. For more great examples of how original vital records differ from publications, see the following article with the revelations of “Ai frost Beard” [Ai Frost Beard] (not Alfrost or Atrost!) and “Ara Fitch” (not Asa!). This was the only record of Ai’s middle name and an invaluable clue because it turned out to be his paternal grandmother’s maiden surname. Streeter, Perry, “Was Louisa, Daughter of Aaron and Lucy ([–?–]) Beard of Connecticut, Massachusetts, and Chenango County, New York, the Second Wife of Thomas Streeter of Steuben County, New York?” The New York Genealogical and Biographical Record, 145:85-99, 222-236, 303-309. This article is also available online as http://www.perrystreeter.com/beard.pdf. Rhonda, wow, a great example from a pro! If one didn’t know about this new online data base, and was searching on ancestry.com or AmericanAncestors.org, would a link to FamilySearch be given? This is the part about being an amateur genealogist that confuses me greatly. I’m pretty much overwhelmed about venturing out beyond the former two sites, where I have memberships.”Hire a genealogist to help!” would have to be my mantra in such cases! Hi Judy, It is unlikely that there would be a link to the page in FamilySearch, which was why I wrote the article in the first place. While the number of online databases are great, especially for those new to the field, they often hinder the new researcher because the newbies don’t know what record alternatives exist or how to effectively work through images. Those of us who spent a lot of time in those microfilms back before everything was indexed are not as overwhelmed about digging into them. But there is always help available. Never be concerned to ask a question of NEHGS staff. We are here to help. So, is the incorrect date for the birth being removed from NEHGS Database “Massachusetts Vital Records to 1850” showing Mendon Births? Or is the mistake still there? Hi Katharine, It cannot be removed from the NEHGS Database “Massachusetts Vital Records to 1850” because that database is digitized images of the original pages as they were published, as can be seen by the first image connected to this blog post. NEHGS would never digitally alter the information of a document, even though that capability has been around for quite some time. I also have found incorrect information even in original state records, with the bride listed as her mother, and the mother’s parents listed as parents of the bride. Regarding a change to the records, is it possible to put a ‘sticky note’ or addendum to these scanned images? I found a great aunt in a cemetery listing under her husband’s original surname, but she had married him after he changed his name. It took me ten years to find this, when a note on the pdf file would have been very useful. It seems sad that people have to go through the same search again and again or remain in doubt, when an answer has already been found. As a librarian, I want to fix this! It’s also good to remember that some of the old handwritten records were later copied, by hand, so that two hand-written copies of the same records exist. If the handwritten copy is very evenly written and easy to read, there’s a good chance that it was copied from an older book. Any transcribing creates an extra opportunity for error. I’m glad the “new” copies exist – an early example of backing up data. And they can help me decipher the older and often harder-to-read records. Thanks for your article. It’s important to look at a record as close to the original as possible, even when there is no hint of a discrepancy as in the original post. You can’t always tell from an index or extract what might be in an original record. Excellent post! There are many examples of incorrect transcriptions, indexing, and conflicting information. That’s what makes genealogy fun! With Ancestry, you can post a comment or a correction (the “sticky note” idea) but that’s not an option with many other sites. 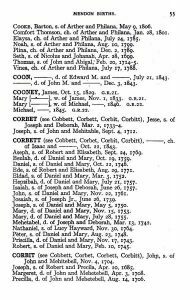 But what I want to know, in Rhonda’s example, is how to interpret the next entry–the one that says, “Mehitabel Corbett daughter of Joseph Corbett and Deborah his wife born March ye 13th 1742.” Is it really 1742? 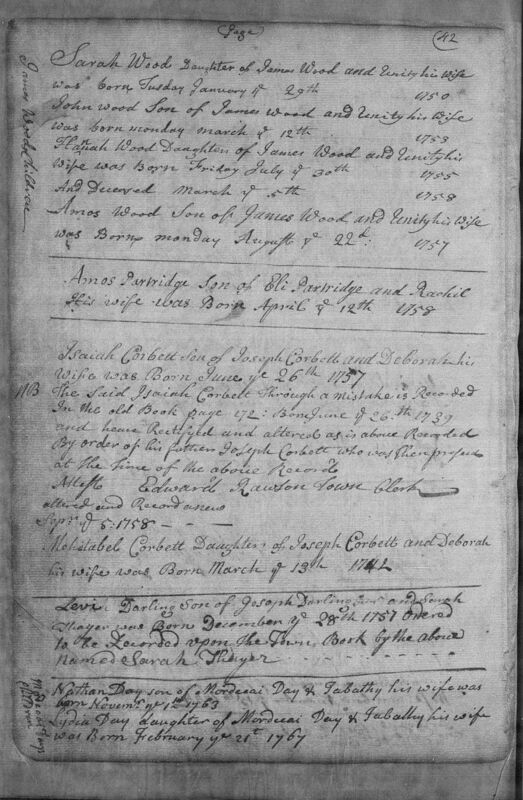 If so, I would think it a reasonable fit with Isaiah born 1739, but the correction is saying he was really born in 1757. An entry for 1742 would not usually follow an entry for 1757. The “4” in 1742 however looks like it has been written over. It would make more sense if Mehitable was born in 1762, but that’s hard to make out from the image. Help me, Rhonda! “Eleazer Albee Son of Ebenezer Albee & Esther his wife was born July ye 28, 1756.” This was among the birth records which had been copied from the original town record into a book of births in April, 1842, which I reviewed at the Mendon Town Hall and is the basis for the printed version on Ancestry.com. In the book transcribed in 1842 for intentions of marriage, marriages, deaths & Misc., the intention of marriage on May 10, 1775 for Mr. Eleazer Albee and Miss Ruhamah Washburn both of Mendon, p. 47, is correctly recorded, as is the marriage on June 2 of Eleazr Albee & Ruhamah Washburn both of Mendon, p. 163. However the births of all of their children are incorrectly recorded as children of “Ebenezer Albee and Ruhamah his wife” on p. 234. But the original recording of the children in the town book (pages not numbered) appears to be Elear or Elenr with the “r” raised, which was read for transcription into the later book as Ebenr. The births of all the children are recorded together and there is a clear difference between the recorded names for the father and the son Ebenr. It is apparent that the original record was intended as “Eleazer and Ruhamah.” In this case, the first version of the record provided clarification. 1762. Note that it was entered into the free space AFTER the correction in the same handwriting as the correction and the other entries sequenced as 1757. Mehitabel is thus most likely J&D’s SECOND (and perhaps last child as no other J&D child was entered there). The clerk did indeed start to make another error by writing 1742 and then immediately corrected himself, albeit weakly, to 1762, and considered it not worth noting as it wasn’t, in his mind, a “full blunder”. But then, that is my interpretation! Ooops! Speaking of errors, this reply got posted to the wrong original. The year is 1762. Note that it was entered into the free space AFTER the correction in the same handwriting as the correction and the other entries sequenced as 1757. Mehitabel is thus most likely J&D’s SECOND (and perhaps last child as no other J&D child was entered there). The clerk did indeed start to make another error by writing 1742 and then immediately corrected himself, albeit weakly, to 1762, and considered it not worth noting as it wasn’t, in his mind, a “full blunder”. I am reading the collection of The Great Migration Newsletter, vol 1-20. I wanted to see what sources were used and how they were analyzed. This has been amazingly instructive as I follow Robert Charles Anderson’s journey. I’ve learned something about how various communities came into being, the different ways that decisions got made,the background of some of those decisions, and (perhaps most of all) some insight into the eccentricities of early records– especially town records,kept by different clerks for different purposes, and in different ways . It’s helping me to understand how to approach these records, with a bit of trepidation, but also with curiosity and creativity, and with a lot of patience. I don’t trust indexes, and I don’t trust compilations. They are wonderful for telling me where to start, but they are only a beginning. Thank you, Rhonda, for adding to my education. I now have a better sense of how to go at reading those original records. It hadn’t occurred to me that just as keepers of records today add in corrections at a later date, so would have the keepers of the early records. Not everything got in right the first time, and not everything got in, period. This page looks like perhaps either a listing of all children from the same parents (newcomers? missed entries?). And perhaps the clerk felt the need to explain this particular error is being corrected: the father insisted on it, from the sounds of things!